2.4GSa/s 16-bit signal generators produce accurate, modulated waveforms at up to 20Vpp. 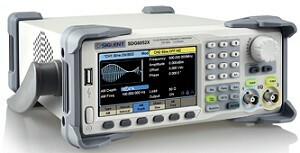 Fairport, NY, USA: Saelig Company, Inc., (Saelig) (www.saelig.com) has introduced Siglent's SDG6000X series of Dual-Channel Pulse/Arbitrary Waveform Generators that create test signals up to 500MHz using a sample rate of 2.4GSa/s and 16-bit vertical resolution for an 80dB dynamic range. This series features Siglent's proprietary TrueArb and EasyPulse technologies that solve the weaknesses inherent in traditional DDS waveform creation. TrueArb technology generates arbitrary waveforms "point-by-point" to produce a very low jitter (< 150ps) output signal from stored memory. Rapid rise and falling edges are enabled with the EasyPulse design, unaffected by frequency setting, extreme duty cycle, or extreme edge and width settings. The SDG6000X generators achieve extremely high accuracy performance in both time domain and amplitude, resulting in more accurately reconstructed waveforms with lower distortion, low noise floor, and excellent signal-to-noise ratio. Available in 200/350/500MHz versions, the SDG6000X series of signal generators feature a 4.3" TFT touch screen display to provide fast operation and a clear view of settings. Waveform rise/fall times can be set independently to a minimum of 1ns at any frequency with a minimum adjustment step as small as 100ps. The pulse width can be fine-tuned to the minimum of 3.3ns with an adjustment step as small as 100ps, at any frequency. These generators can produce conventional waveforms, Noise, IQ signals, and PRBS patterns with a maximum amplitude of 20V pp. EasyWave software, provided free, is a powerful arbitrary waveform editing application that supports many means of conveniently generating or editing arbitrary waveforms, such as manual drawing, line-drawing, equation-drawing, coordinate-drawing, etc. The SDG6000X series has independent dual generators that offer 196 built-in arbitrary waveforms with a high-precision 8-digit 0.1Hz to 400MHz dual-channel Frequency Counter that offers a statistics functionality. Standard interfaces include USB Host, USB Device, LAN（VXI-11, Socket, Telnet) with optional GPIB. Signal generating capability includes Modulation, Sweep, Burst, and Waveform Combination. Multiple modulation types are supported, including AM, FM, PM, FSK, ASK, PSK, DSBAM, PWM. The modulation source can be configured as internal or external. Modulation sweep modes include linear and log. Burst modes include N cycle and gated. Both sweep and burst can be triggered by internal, external or manual source, while IQ signal modulation is an option. The Waveform Combining mode superimposes CH1 and CH2 waveforms internally, outputting the resulting waveform that can be a combination of basic waveforms, random noise, modulation signals, sweep signals, or burst signals, etc.